7/18/13 Homework 3-4 is available, as are the rest of the slides. Enjoy! 7/16/13 We've continued to add new slides, as announced. 7/3/13 All past slides and lab materials are now posted below, some of them with post hoc improvements. 7/3/13 The second homework is now available. Due on Saturday, but please do the first two parts before Friday's lecture. 6/25/13 Thanks for an enjoyable first class. Slides and the first homework are posted below. Please do as much of the first homework as you can before the next lecture; you may work together. 6/5/13 Please enroll for the Piazza discussion site. 6/5/13 Please bookmark this page (http://cs.jhu.edu/~jason/licl). This class presents fundamental methods of computational linguistics. 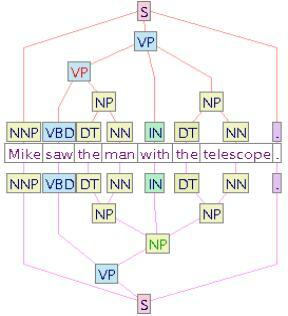 We will develop probabilistic models to describe what trees and sequences are likely in a language. After estimating the parameters of such models, it is possible to recover underlying structure from surface observations. We will examine algorithms to accomplish these tasks. We will also survey a range of current tasks in applied natural language processing. Many of these tasks can be addressed with techniques from the class. Some previous exposure to probability and programming may be helpful. However, probabilistic modeling techniques will be carefully introduced, and programming expertise will not be required. We will use a very high-level language (Dyna) to describe algorithms and visualize their execution. Office hrs: TBA, in Mason Hall 2475 or 2455. May include a weekly dinner with interested students. Or are these statistics? What are "statistics" anyway? How are they different from "information"? Note: Lecture schedule below is tentative. Assignments and readings will be added. Note: Additional slides plus more computationally intensive assignments are available from my NLP course at Johns Hopkins, which is more than twice as long and assumes more computational background (but no prior linguistic background). Here's an old list of other NLP courses.